All of Your Family’s Smile Needs…in One Place! The term family has multiple meanings at Masella Family Dental. Every team member understands the importance of family, and we treat each patient as if they are part of ours. Having been busy parents themselves, our dentists know what it’s like to need to put your family first. That’s one of the main reasons we are committed to making access to dental care simple. Our flexible office hours allow you and your children get treatment when you need it most. We utilize advanced technology with a caring approach, helping us exceed your expectations. We know that once you visit Masella Family Dental, you won’t want to go anywhere else! Every new patient receives a comprehensive exam to assess his or her smile, bite, TMJ function, bone height, and risk for disease. At return visits, we will also provide periodic exams that note changes from your first exam. This helps Dr. Masella pinpoint problems as soon as they begin to develop. The earlier the needs are addressed, the simpler the course of treatment can be! Dr. Mike doesn’t believe that we should put limits on the treatment options available to our patients–not in this day and age! We have the highest level of technology, allowing us to offer the best care to every patient. For example, our on-site CT scanning technology allows us to capture 3D images of the teeth, jaw, and skull, which is especially useful for treatments like implant therapy. In fact, patients who were previously told they weren’t candidates for dental implants may still be able to have their treatment completed at Masella Family Dental, thanks to our in-house access to this technology. The ability to visualize bone in 3D makes treatment much more precise and extremely successful. We don’t need to send you down the road to let someone else look at you – why would we do that when our technology is superior to any in the area? Drs. Mike and Tom love to show patients what they see during their exams. With our intra-oral cameras, we can! These small HD cameras can capture high quality images of the teeth or other areas of the mouth. The image is then placed on our in-room monitor to discuss findings with the patient. Not only does this increase our ability to communicate with patients, it empowers our patients to make educated choices regarding their oral health care. Preventive care keeps gum disease at bay, and catches problems when they’re still small. Our hygiene department, headed up by Patti, uses ultrasonic instruments for gentle and effective dental cleanings. Dr. Tom started the Honeymoon Special and it is still as popular today as it ever was. If someone in your immediate family is getting married then stop by the week before and we will polish you up for free and get your smile camera ready. We also offer free checkups to children under the age of 3. Dental care makes some people nervous, and that’s ok. We offer nitrous oxide sedation for any procedure at Masella Family Dental. Nitrous oxide is a safe, effective way to help patients of all ages feel more relaxed during their dental treatment. For the patients who require extensive treatment, an anesthesiologist can sedate them using IV medication. Your treatment will be completed while you peacefully sleep. Oral cancer causes more loss of life than cervical cancer or melanoma. Pinpointing precancerous and abnormal tissues when they are small means treatment outcomes are more effective. You don’t have to smoke or be “at risk” in order to be diagnosed with the disease. Our dentists conduct a thorough oral cancer screening during every exam. We’re always ready for your dental emergency, even if you aren’t. No matter what the cause or when it happens, we want you to know that you can contact us immediately – day or night. 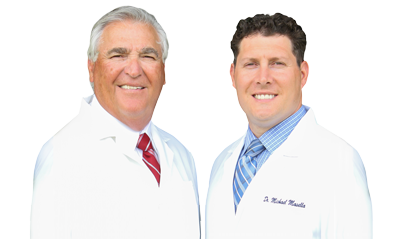 Dr. Tom and Dr. Mike pride themselves on 24/7 care. We’ll do our best to accommodate your needs as soon as possible. If it’s pain or a broken tooth, we’ll be prepared to put your mind at ease and put a smile back on your face. How many dentists do you know who give out their personal cell phone number?